Then, clear your schedule for this evening and go home to make this soup - this totally incredible soup that rendered us, and Ben's mother, practically speechless when we first ate it on Monday night. It's as simple as could possibly be - just a bunch of chunked plum tomatoes (ours were so perfect they were deep red and dripping with juice) cooked for an hour with onion and garlic, but then - then! - you stir in cubes of bread and let them simmer in the soup before serving it with little strips of basil and a snow-white grating of ricotta salata, and suddenly you're faced with what has turned out to be the best summer soup you ever ate, I swear it. Take a cooled spoonful in your mouth (if you can wait long enough for it to cool, that is) - you'll feel the bread, like custard, suspended in the gently silky tomatoes, the basil adding perfume and heaven-sent flavor, the crumbly, dry-ish cheese providing salt and kicky texture. The whole thing will be exquisite. Swallowing will be tragic - it's one less spoonful you've got to savor. You might swear to never eat anything else ever again. The recipe comes from Bill Telepan (I can't for the life of me remember its context in the NYT), but his version adds a can of peeled tomatoes. Perhaps, if your plum tomatoes were a bit mealy and less than perfect or if you were making this in winter, I could see why you'd be interested in adding canned ones, but with the glorious specimens available right now? It just seems silly. Also, he says to use stale sourdough and soak the cubes in water before squeezing them by the handful and cooking them in the soup. I'm sure that's fine, but my bread was fresh and it worked perfectly, so you can go either way on this one. Third of all, he says to peel and de-seed your tomatoes. I am far, far too lazy for that kind of behavior, but I am testimony to the fact that it doesn't matter at all - with seeds and peels, this soup is still one of the best things I've cooked all summer. Okay, that's it, enough reading, off you go. You've got tomatoes to buy and soup to prepare. And if I may offer one more bit of advice, buy twice the amount of tomatoes required. Because when you're standing in front of your stove looking down at an empty soup pot, wondering what could have possessed you to be so generous as to share your meal with the people at your table, you'll feel some relief at the prospect of being able to whip up another batch, right then and there. 1. Core and quarter plum tomatoes. Place tomatoes in food processor and pulse to chop, but not too fine. 2. Heat oil in 4-quart saucepan. Add onion and garlic and saute until soft, but not browned. Add tomatoes and their juices. Season with salt and pepper, bring to a slow simmer and cook 45 minutes, covered, stirring from time to time. 3. When the soup has simmered for 45 minutes, stir the bread cubes into the soup and simmer for an additional 10 to 15 minutes. Check the seasoning. 4. 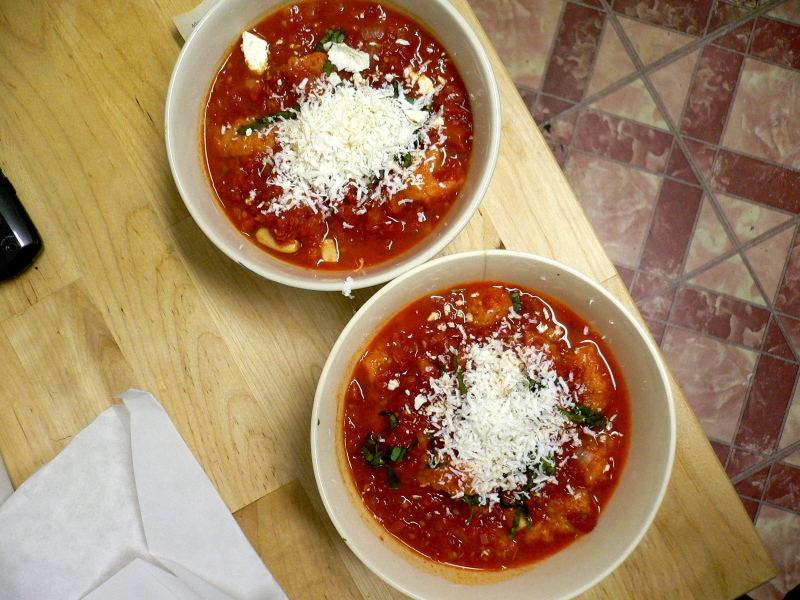 Serve hot or at room temperature, with grated ricotta salata and minced basil strewn on each serving. Click here to see more photos from the book!